How to Draw Female Figure? It is understood by canon provided the human figure an orientation code, using mathematical formulas, provides the ideal proportions of the human body, dividing it into sectors that are called modules that facilitate the distribution of membership and calculating the proportions of female body in this case. The figure we call “academic” derives from classical Greco-Roman canon. It is a standardized view of the body does not correspond to any particular individual but exemplifies the general idea of women body. The main utility of a classic canon is to be constructed from references involving the divisions between modules. This module system also allows referencing other significant points that are helpful to understand the anatomy and facilitate the representation of the figure, as well as locate references in width to check the most important districts. The canon of eight heads is valid for the study of drawing in general, but not the right to represent the fashion plate. In schools fashion designers alumnus work with the canon of eight heads and media, which responds to two reasons: the first is to give more slender body (stylizing the figure as exaggerated many times so that the sketch is extremely elegant and slender). The female figurine is almost always depicted with high heels. The prototype drawing body fashion shows higher than the Greco- Roman classical canon. The size of the head plays a key role in the construc tion of the female figure in a proportionate; it serves as a basic measuring module. No wonder the total height of the figure of an adult is eight times this dimension. 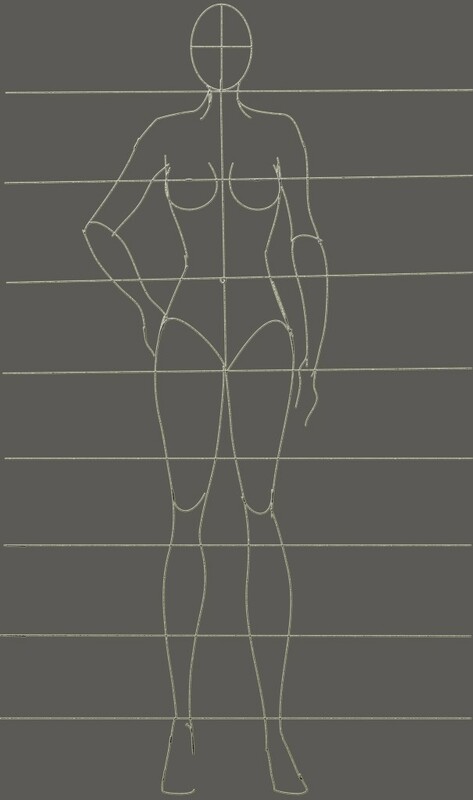 To draw a correctly proportioned figure, the head height is measured. A vertical line is drawn and the measure is marked on the line eight times or nine if you want to achieve a well stylized figure. Since these vertical horizontal lines that allow us to build the female figure is projected. The lower extremities can measure four to five modules. This is the graphical representation of the model hanger dressing creations. It is constructed from a line drawing that enhances the pose and the most prominent profile curves of figure. Here is the figurine, which can be used again as a template for different creations base. The figurine should show a vivid expression and submit a satisfactory online, offering all the information needed to understand the pose and anatomy model. To get an interesting line, the designer must combine different stroke widths. In this sense, we can use pen tilt to modulate the line, or alter the pressure and angle of the brush. A useful exercise is to try to make with one stroke the figurine to give flexibility to the sketch. How fashion illustration can make us trendy?